The owners of a marina recently had spotted a large alligator on a few occasions, and put up a sign warning people to stay out of the water. They estimated that animal was longer than 11 feet. ORANGE, Texas (AP) — A man was killed when an alligator attacked him during a late-night swim at a Southeast Texas marina, according to police. Orange police Capt. Robert Enmon said Tommie Woodward, 28, suffered severe trauma to a limb when he was attacked early Friday morning at the private marina, which is along a bayou extending from the Sabine River near the Louisiana line. Orange County sheriff's deputies and a Texas game warden found his body nearby about two hours later. Police said Woodward, who lived near the marina in Orange, was swimming with a woman, but Justice of the Peace Rodney Price told KFDM-TV in Beaumont that she only jumped from a dock after he screamed for help. The woman was not hurt. Price said it appears Woodward was bitten soon after he jumped in. 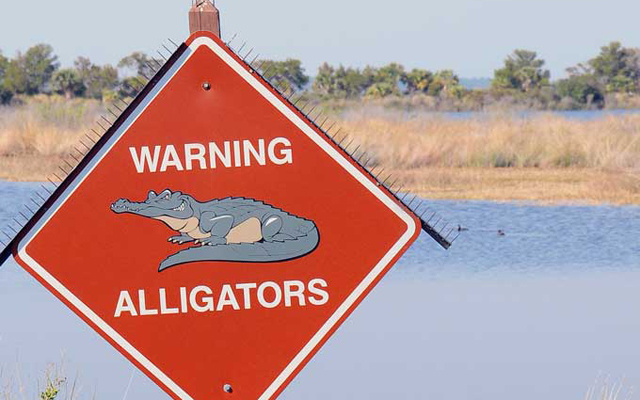 The owners of the marina recently had spotted a large alligator on a few occasions, and put up a sign warning people to stay out of the water, Enmon said. They estimated that animal was longer than 11 feet. The reptile could have been startled early Friday or was possibly protecting its habitat, Enmon said. “You've got to remember that alligators are a predatory species, they are territorial, and they will take advantage of an opportunity,'' he said. Authorities are not hunting the alligator but a private effort may be launched to capture it, he said. This is the first fatal encounter with an alligator that Enmon can recall in his 25 years in law enforcement.